The IRB 910SC (SCARA) is fast, cost-effective and, because it‘s from ABB, accurate. With a maximum payload of 6 kg, the IRB 910SC is available in three configurations (IRB 910SC –3/0.45, IRB 910SC – 3/0.55m, and IRB 910SC – 3/0.65.) All are modular by design, with different linking arm lengths and have individual reaches of 450 mm, 550 mm and 650 mm, respectively. Tabletop mountable, each member of our SCARA family is IP54-rated for optimum protection against dust and liquids. A Clean Room ISO-5 option is under development. 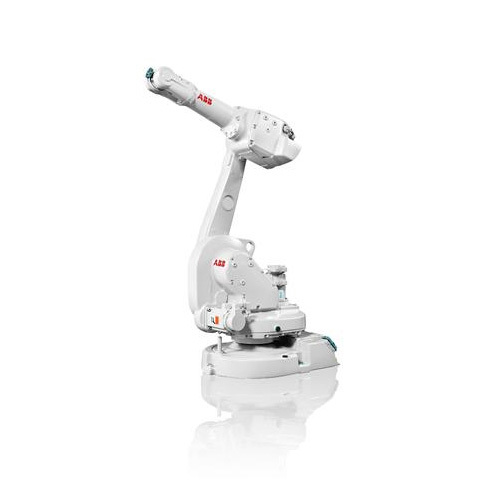 ABB dual arm robots have accurate vision, dexterous grippers, sensitive force control feedback, flexible software and built-in safety features that collectively allow for programming through teaching rather than coding. 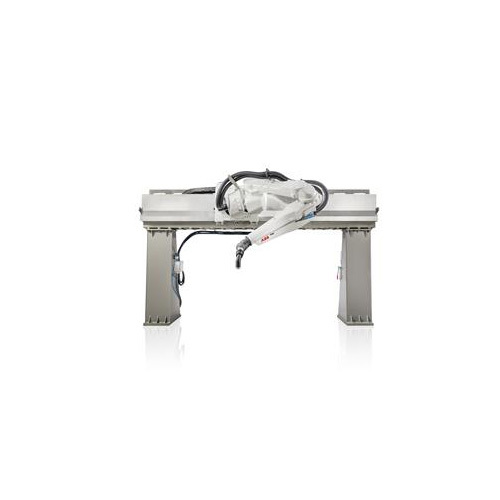 The only track motion platform on the market to guarantee high speed and precision accuracy, the IRBT 2005 from ABB offers greater flexibility and up to 50% shorter cycle times. 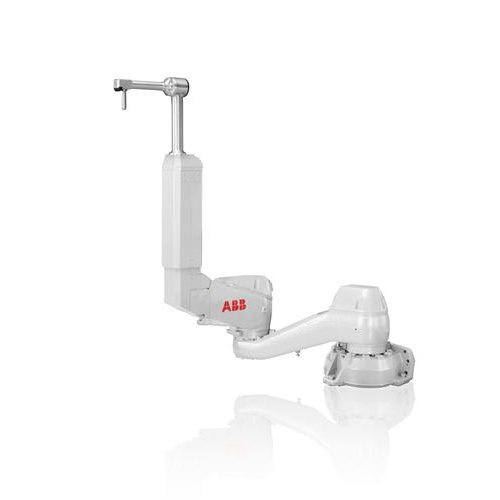 ABB’s Medium Track Motion (MTM)’s design is smart and compact with a symmetrical profile. Maximum integration ensures the protection of components in a small footprint. The IRBT 2005 consists of a standard 1 meter long module that allows for the addition of numerous track and travel lengths for robots and transfer applications. The track’s modularity allows for product evolution during its entire life span. Adaptable to various environments, the IRBT 2005 is available in two variants, standard uncovered and fully covered. The IRBT 2005 is available with multiple carriages - two for the robot and up to three for transfer applications. The robot track is available with additional carriage plates that allow them to carry the required equipment for specific applications such as Arc Welding and Sealing. The internal cable chain of IRBT 2005 can be delivered pre-equipped with the suitable cables for different arc welding sources, or different customer power and signal cables. Each robot carriage has the option of being equipped with an empty external cable chain for additional application cables. 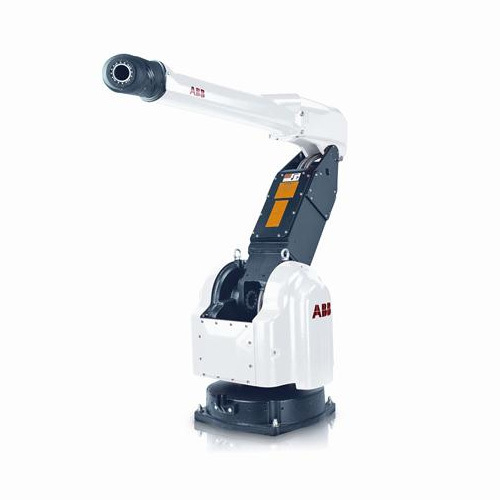 Robot pedestals range from 250mm to 1000mm and can be selected as can robot orientations. 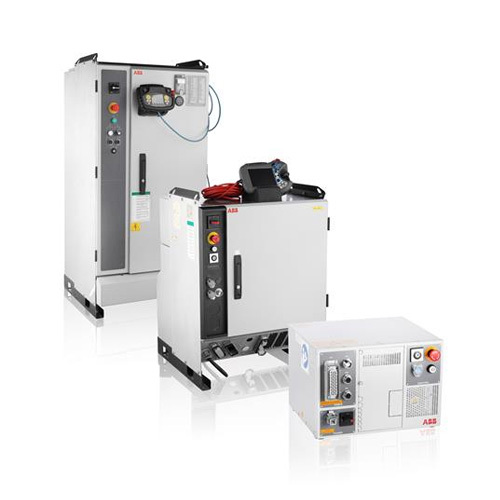 ABB’s unique QuickMove™ and TrueMove are also critical to the MTM’s functionality. Together they guarantee optimal movement for the robot and the track with actual load. Path accuracy and speed are also optimized. 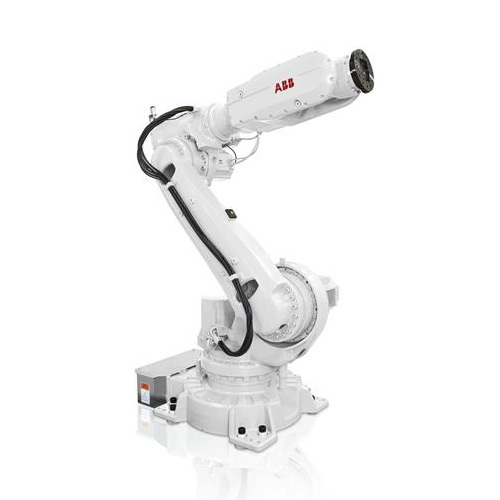 ABB provides a comprehensive range of robots to help manufacturers improve productivity, product quality and worker safety. Regardless of application we have a robot to meet your needs. 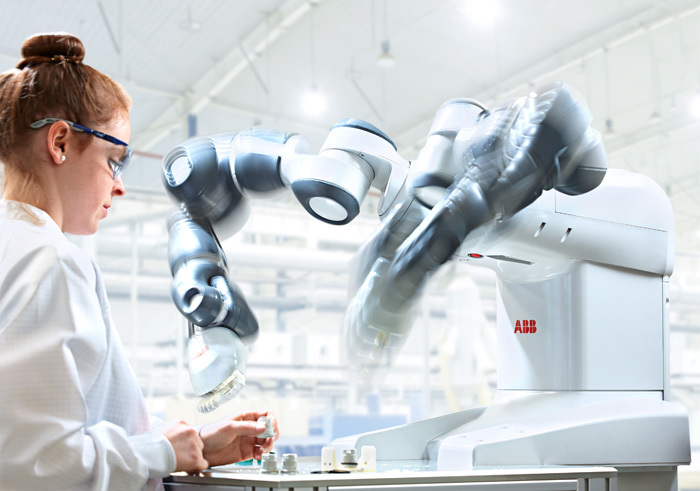 ABB has installed more than 250,000 robots worldwide. Have you ever wanted to make your machines 15% smaller and 10% faster? ABB’s IRB 1200 allows you to do exactly that. Specifically, it addresses the needs of the material handling and machine tending industries for flexibility, ease of use, compactness and short cycle times while still maintaining large working envelopes. 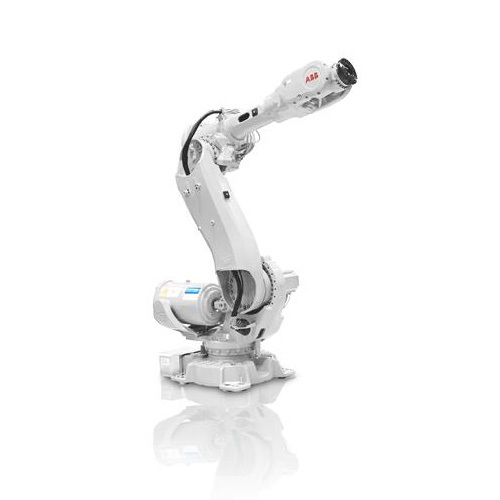 Available in standard, FoundryPlus, Clean Room & washdown versions, the robot is IP67 protected in its entirety, making it suitable for a wide range of applications. 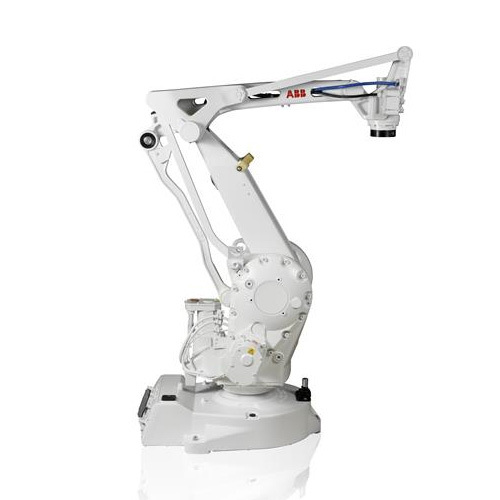 IRB 1410 is a well-proven and cost-efficient robot with a stroke and reach sufficient for most arc welding applications. It is based on IRB 1400, delivered in over 14,000 units world-wide. IRB 1410 is only delivered in the function package IRB 1410 ArcPack. The IRB 1520ID can be up and running in hours and will boost your productivity with cost-efficient and highly reliable production. ​Thanks to the integrated dressing, the hose package on the upper arm and the welding cablings at the base are totally integrated into the robot. This means that all the media necessary for arc welding, including power, welding wire, shielding gas and pressurized air, is routed for maximized performance and energy efficiency. Performance is often a trade off, optimizing for speed or accuracy. With ABB’s IRB 1600, you don’t have to choose. The robot’s cycle times are shorter, sometimes half that of other robots’, allowing you to increase throughput. 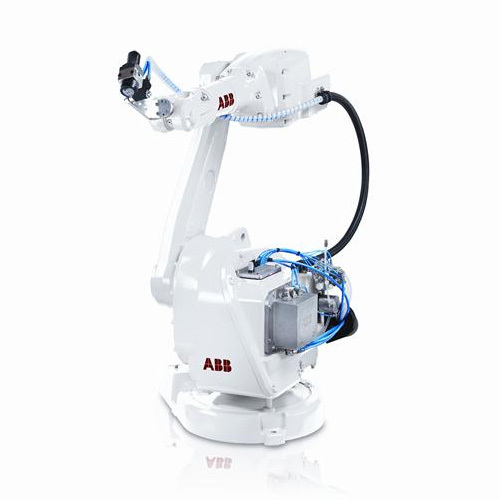 Meanwhile, you will enjoy the work piece quality that only an ABB robot can offer. Extra everything. The IRB 1600 has up to 50% shorter cycle times than competing robots in Material Handling, Machine Tending and process applications. At high speed, most robots will cut corners. With the IRB 1600, the path will be the same regardless of speed, thanks to the robot’s unique combination of brains and muscles. The IRB 1600 offers outstanding reliability, even in the toughest environments and the most demanding 24/7 duty cycles. Mounting is fully flexible: on a shelf, on the wall, tilted or inverted. You can even fit the IRB 1600 inside a machine. Low friction spur gears, and no unnecessary moves due to QuickMove and TrueMove, bring power consumption down to 0.58 kW at max speed, and even lower at low speeds. 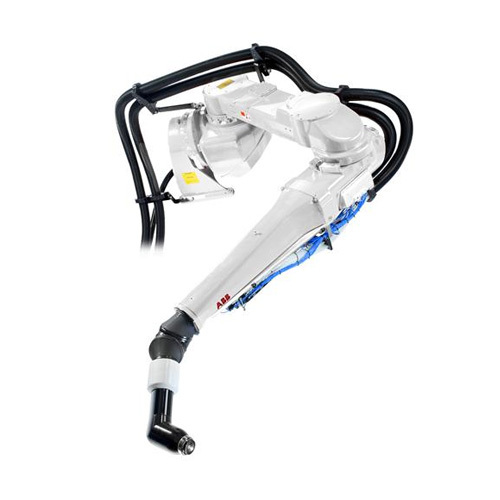 In IRB 1600ID (Integrated Dressing), all cables and hoses are routed inside the upper arm, making the robot perfectly suitable for arc welding. The dress pack carries all the media necessary for arc welding, including power, welding wire, shielding gas and pressurized air. Faulty process cabling is a common cause of unpredicted line stops. With the IRB1600ID, stops can be reduced to a minimum. Because the cables are routed inside the upper arm, their motion is predicted given a certain cycle. When the motion is predicted, so is the lifetime. There is always a blind spot when programming a conventional robot. Because of the external routing of the dress pack and its unpredictable motion, programmers have to use their imagination to ensure the dress pack won’t hit anything during operation. Payload is 4 kg and maximum reach 1.5 m.
Payload options are between 12-20 kg. 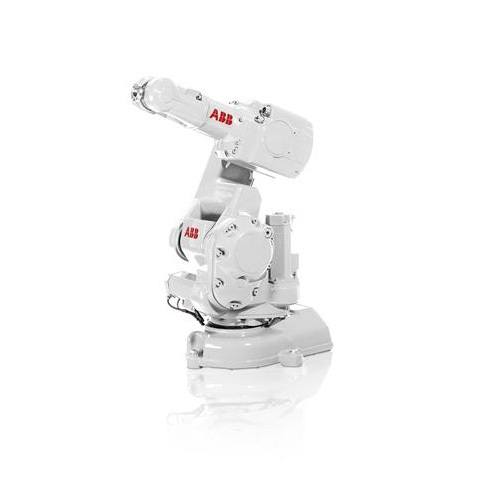 Max reach 1.55 m.
ABB further extends its mid range robot family with the new IRB 2600. A new compact design that offers a high payload capacity of up to 20kg and a working range optimized for material handling, machine tending and arc welding. It also offers the best accuracy and acceleration in its class, securing high output and low scrap rates for improved productivity. Flexible mounting possibilities including floor, tilted, wall, inverted or shelf mounted, which help to reduce floor space and increase access to the equipment being served. The wall mounted version has outstanding performance. These features enable more creative cell designs and enables floor space to be optimized in a wide variety of industrial segments and applications. Three versions: two short arm variants (1.65m) for 12 or 20 kg payloads and a long arm variant (1.85m) with a 12 kg payload. Up to 27 kg payload is achievable for pick & place, and packaging applications, with the wrist held vertical. Thanks to the Integrated Dressing (ID) technology and the larger working envelope, cycle times can be reduce by up to 15% and cost of ownership reduced by 75%. 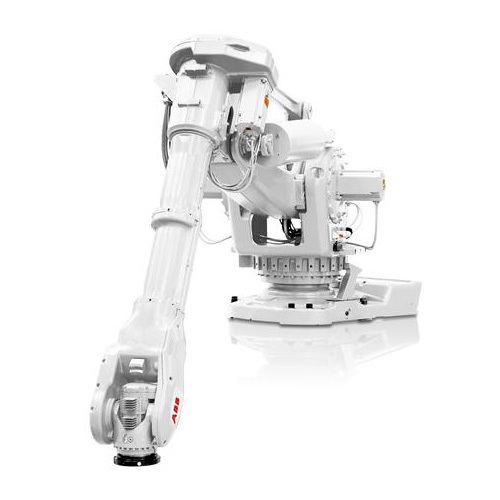 There are two versions available: 15kg with 1.85m reach and 8kg with 2.0m reach. With the IRB 2600ID cycle times are significantly reduced and reliability increased. 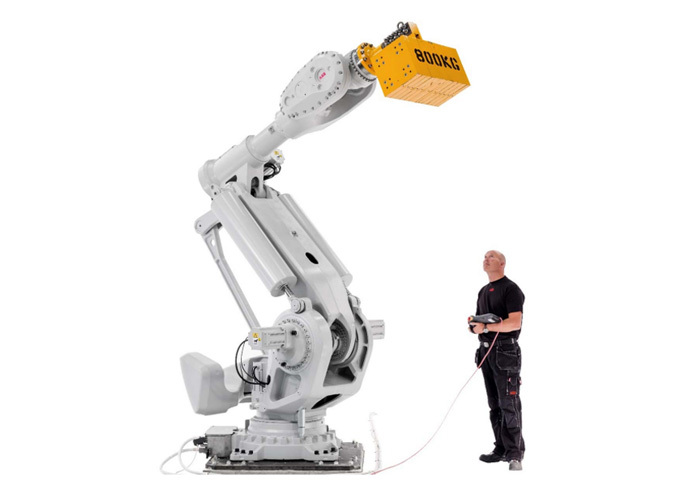 With all cables and hoses firmly secured, movements are easily predicted making off-line programming and simulations perfect representations of the actual robot system. Programming is faster and more reliable. And with less swing of cables, the robot can run at maximum achievable acceleration at all times. 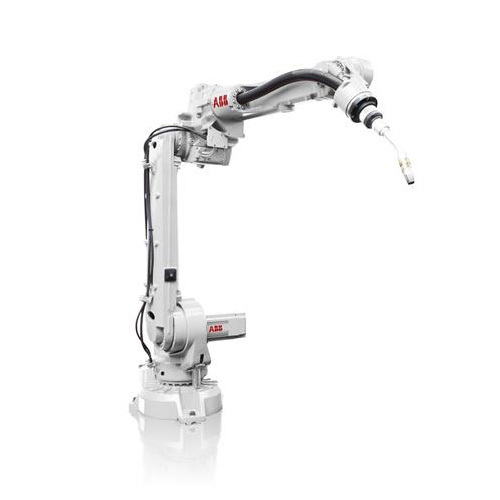 With its compact design and without loose hoses and cables, the IRB 2600ID has a very small footprint allowing for productive, high-density installations with 50% more robots, and up to 50% higher output from a production cell. Optional FoundryPlus version - can be washed down with high pressure steam. Optional FoundryPrime version - for waterjet cleaning of castings and machined parts. 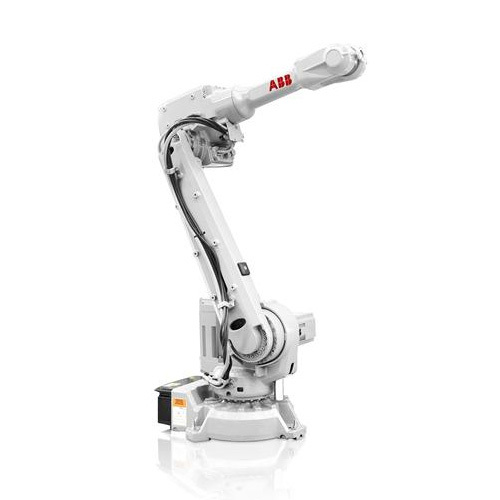 Leading ABB’s new palletizing offering is the compact, 110 kg capacity, IRB 460 - the fastest palletizing robot in the world. Capable of up to 2,190 cycles per hour, this 4-axis robot is perfect for high-speed end-of-line palletizing and bag palletizing. The IRB 460 has a reach of 2.4 meters, occupies 20 percent less floor space and runs 15% faster than its nearest rivals. NEW: Also available is the PalletPack 460 Function Package. This is a set of pre-engineered products configured for end-of-line palletizing that greatly improves ease of use for integrators. 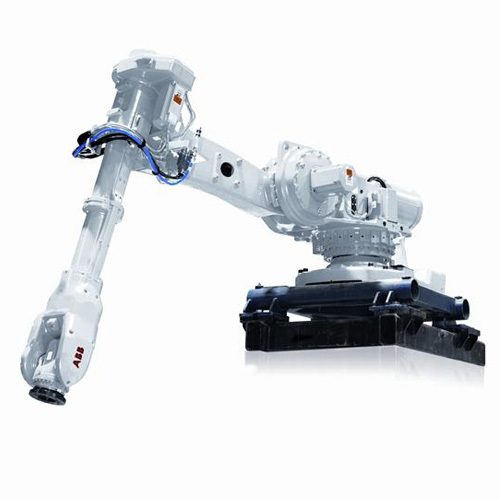 It is available for either high-speed bag palletizing or compact end-of-line case palletizing and consists of IRB 460 palletizing robot, IRC5 controller, Flex-Gripper (either the Claw or one-zone Clamp gripper), dressing kit, ABB PLC, Jokab Safety PLC, software, user documentation and FlexPendant with tailored graphical HMI. New Design. New Features. New Technologies. The IRB 660 is considerably faster than its predecessor. Its optimized motor power and motion performance ensure significantly shorter cycle times than competing products. Outstanding position repeatability (± 0.2mm) and very good path accuracy. The robot’s rugged design and IP 67 tightness make for steady performance in even the toughest environments. IRB 6620 was developed with our major automotive customers to be compact and agile. Its unique design makes it possible to mount the robot floor standing, shelf, inverted or in tilted positions. 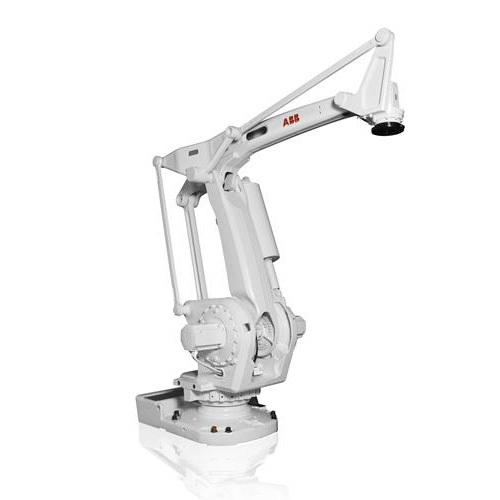 ABB's IRB 6620LX combines the advantages of both a linear axis and a 5 axis robot, resulting in a 6-axis robot with a 150 kg payload capacity, large scalable work envelope and the inherent flexibility of ABB's proven articulated arm robots. It is designed with high performance and reliability in mind resulting in increased productivity and high utilization. 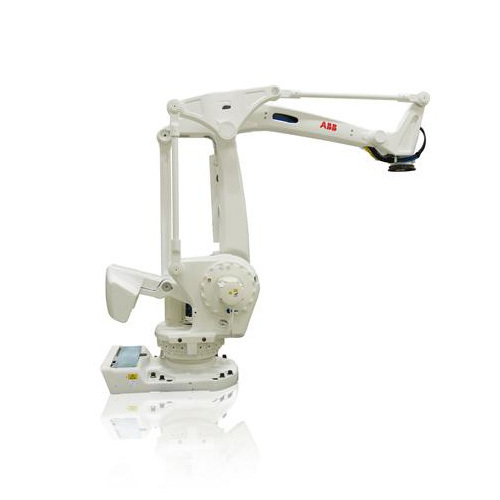 IRB 6640 remains the perfect robot for various applications focusing on high production capacity. Still available is our two Foundry Prime variants with a payload of up to 235 kg, the IRB 6640 is especially suited for harsh washing and cleaning applications. 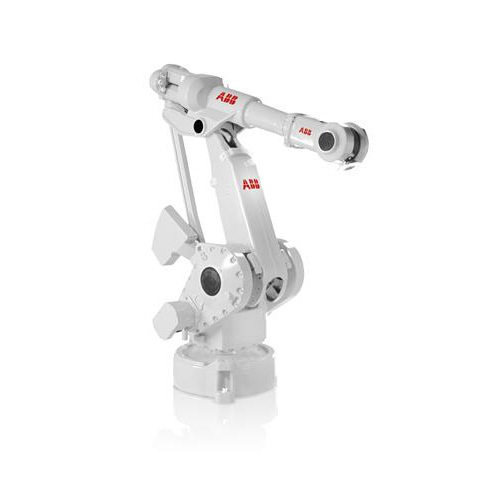 The IRB 6650S is the shelf robot form of the Power Robot family which offers a unique working envelope. 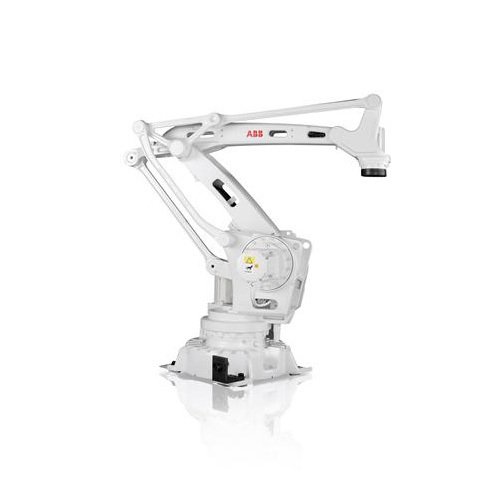 The IRB 6650S is capable of a full vertical and horizontal stroke motion, as well as an increased forward and downward reach. 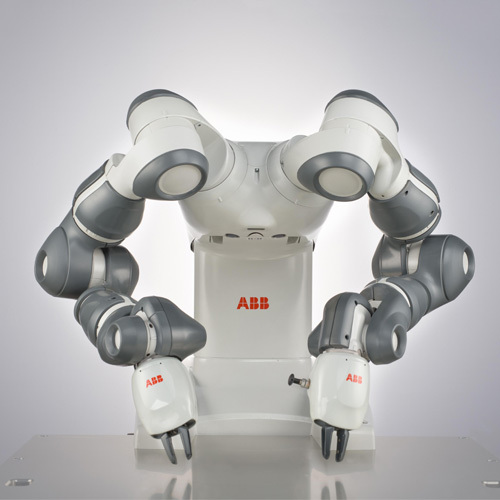 This combination offers new possibilities to robot functions in numerous application areas. 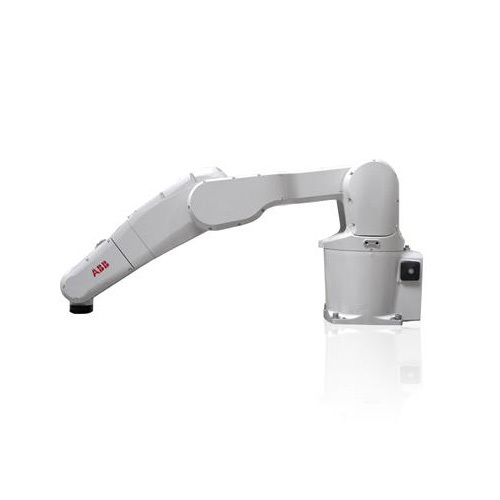 The main goal of IRB 6660 is to provide a faster robotics solution within the press tending application. Concerning part transferring operations, it’s very important to reduce press occupation time. By improving the robot speed performance, the output of the press line is greatly increased. The new striff design together wiht the long reach is perfect for high-performance press tending applications. This results in high accuracy and uptime. This robot is fast, and 15% shorter cycle times are normally achieved inside the presses. 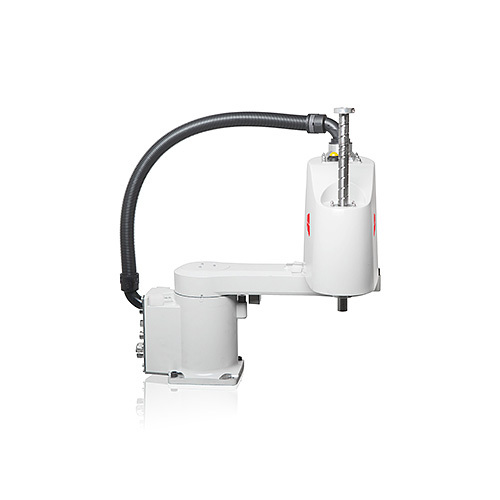 The overall cycle time is directly affected by using this faster robot, and so the line output. The most gears have been reinforced, gear life time is also improved when running fast in press tending. 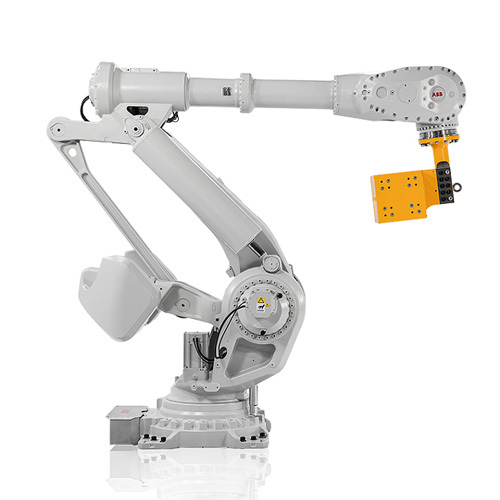 Using proven components from the IRB 6600 family creates an extremely reliable robot. 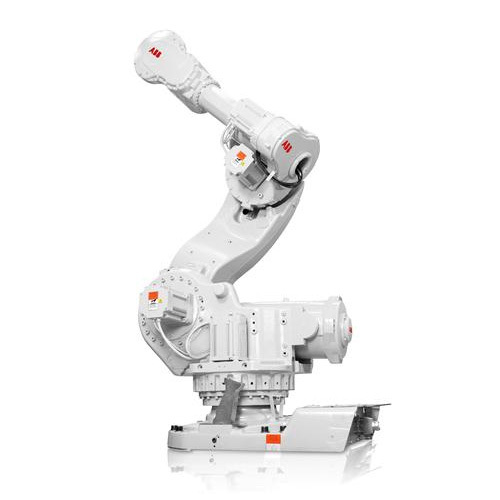 The IRB 6660 for pre machining is the first robot on the market that is dedicated to pre-machining applications in the Foundry industry. This new robot is designed for high-performance applications where robot stability is a key factor for success. Based on reqiurements from machining operations. For applications such as finishing, milling, grinding, cutting & sawing. Stiff, compact & robust design to withstand high process forces. 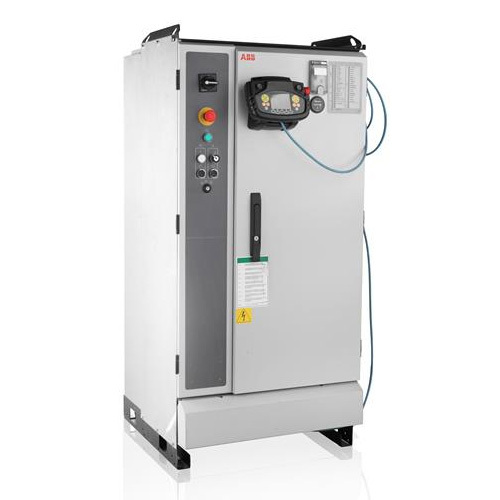 Its latest solution, the IRB 6660FX, is a rapid and flexible transfer system for medium size parts. 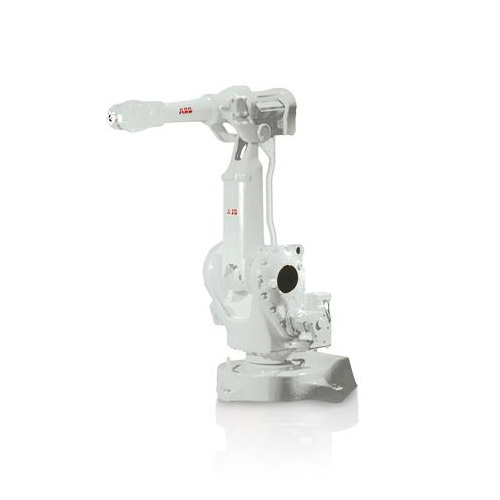 Identical in design to ABB’s large part transfer system, the IRB 7600FX, the IRB 6660FX is a perfect complement to ABB’s parts transfer offering. 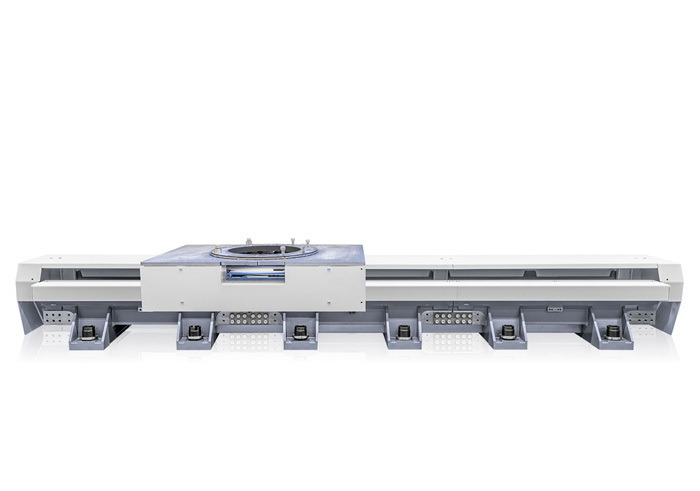 Suitable for both new and existing press lines, a dual action unit has been integrated into the IRB 6660 to create a 7-axis robot, which allows medium size parts to be transferred rapidly along a linear path. As a result, vibrations created when parts are rotated 180° by a conventional 6-axis robot are eliminated. The system is also equipped with integrated dynamic model control to coordinate all seven axes to ensure optimum speed, accuracy and lifetime. 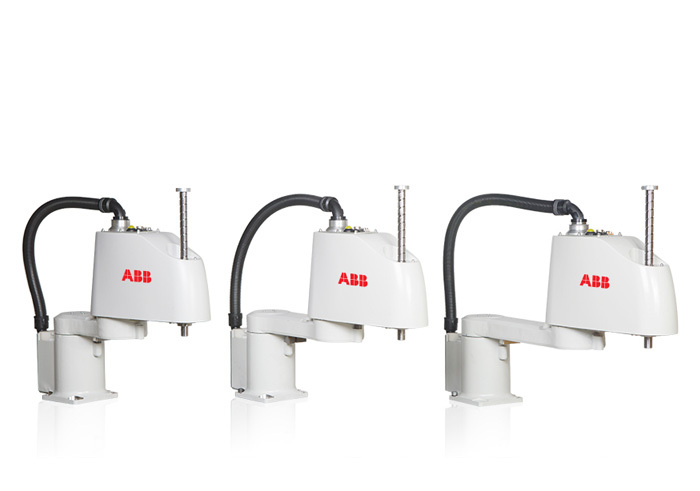 The IRB 6700 family of robots is a natural evolution following 40 years of large robot heritage at ABB. 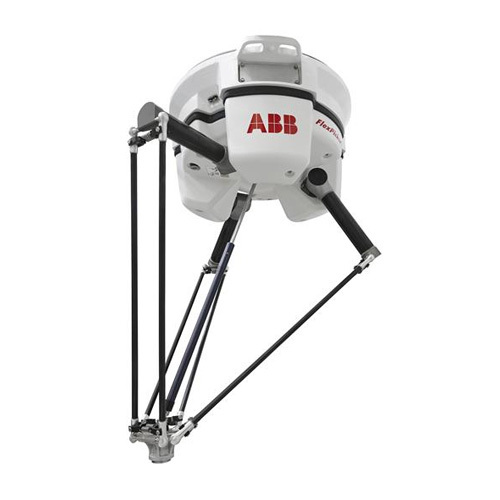 A new world of possibilities opens up with ABB’s power robot family. It comes in several variants, up to 630 kg handling capacities. The IRB 7600 is ideal for weighty applications, regardless of industry. 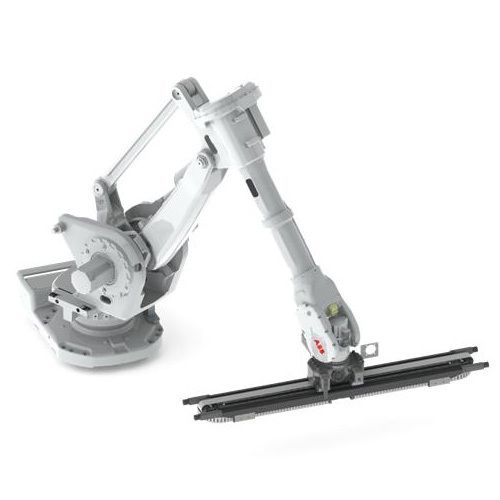 Characteristics such as high available torque and inertia capability, rigid design and powerful acceleration have earned this market leader its “Power Robot” title. 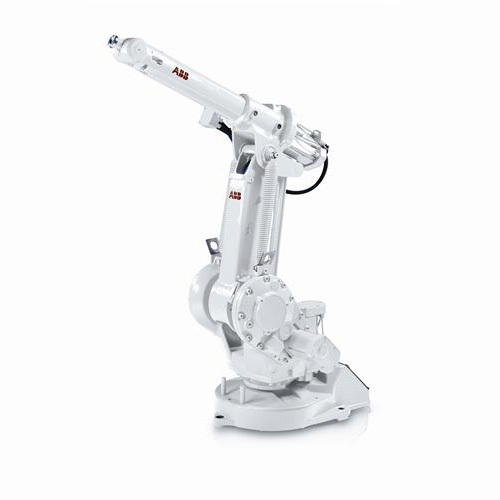 The IRB 52 is a compact painting robot designed specifically for consumable parts painting in general industry. With its small size and large working envelope, it is flexible and versatile, while its high speed and accuracy offers short cycle times. It includes ABB’s unique integrated paint system, IPS. 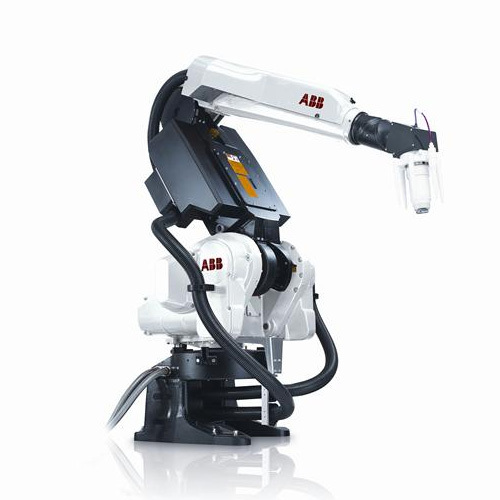 A highly flexible, cost-effective and accurate paint robot system. Precision has always been our primary goal and the common denominator of our globally renowned paint robots. IRB 580 takes precision a step further by combining the advanced functions of the IRB 5400 series with a compact design. The FlexLine system provides paint solutions which maximize your performance and minimize your costs. The IRB 5400 is a family of paint robots offering accurate painting, high uptime, low paint consumption, short cycle times and effective integration of paint application equipment. Additional benefits include an expansive working envelope, high load capacity and reliable operation. ABB's unique Integrated Process System (IPS) features closed loop regulation and high-speed control for paint and airflow adjustment which minimizes overspray and secures a uniform film build. The time and paint savings of the IRB 5400-series will impress you. By integrating colour change valves, pumps, flow sensors and air- and paint regulators into the arm of the IRB 5400, we have made the IRB 5400 one of the most reliable, cost-effective paint process robots in its class. 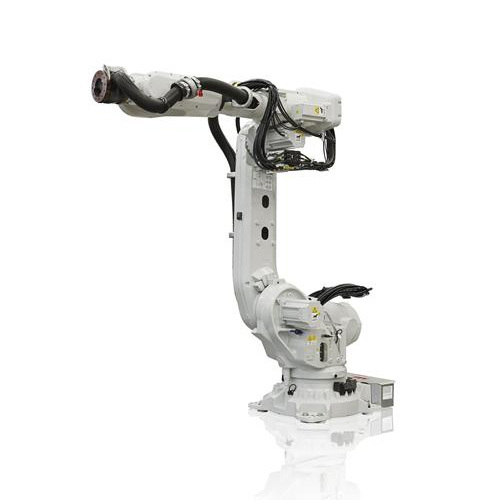 The unique design and configuration of the wall mounted FlexPainter IRB 5500 has created the largest and most flexible robot working envelope of any exterior car body paint robot. It takes two FlexPainter IRB 5500s to handle jobs that up until now have required four paint robots. The results are lower cost, both initially and in the long run, faster installation, high uptime and reliability. The Elevated Rail for the IRB 5500-25 reduces cycle times by as much as 10% on Stop & Go automotive paint lines. The Elevated Rail for the IRB 5500-25 system is one of the most advanced paint solutions available on the market. Ideally suited for both interior and exterior automotive painting as well as other paint applications, the system expands the fl exibility of the IRB 5500-25 FlexPainter, which is the most versatile working envelope of any paint robot. 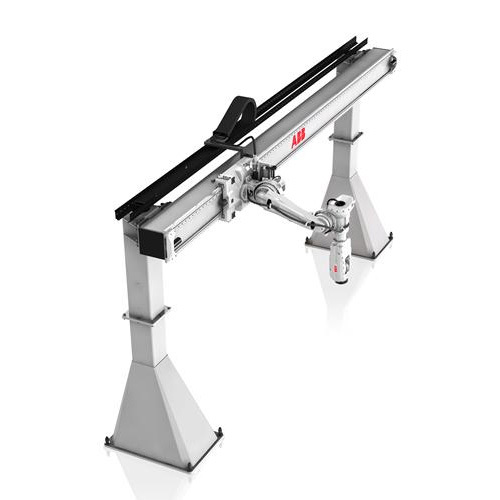 Designed for Stop & Go automotive paint lines, the Elevated Rail for the IRB 5500-25 increases the flexibility on these types of lines and allows for easy repositioning of the robot, guaranteeing an effective backup solution. It is able to accommodate most car body sizes which has the added advantage of potentially reducing the number of robots on a paint line. This added flexibility and the ability to place the robot in an optimal position directly contributes to reducing cycle times by up to 10%. 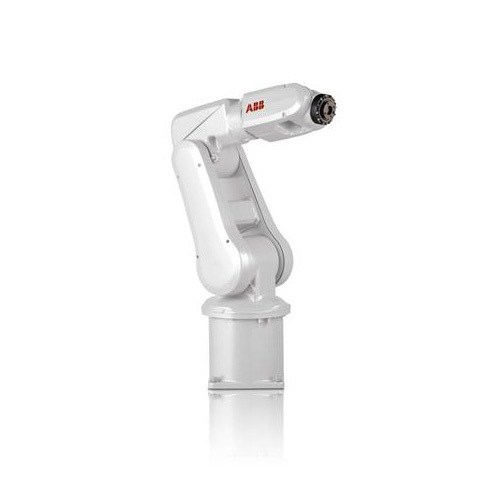 For nearly 15 years, ABB’s IRB 360 FlexPicker has been the leader in state-of-the-art high speed robotic picking and packing technology. Compared to conventional hard automation, the IRB 360 offers much greater flexibility in a compact footprint while maintaining accuracy and high payloads. 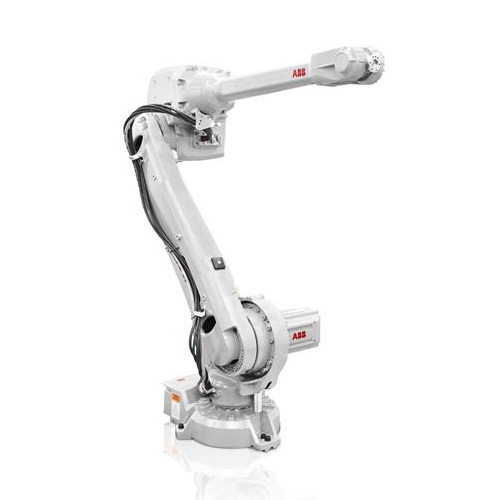 With the introduction of the IRB 360-6, the latest robot to be added to the IRB 360 family, ABB has delivered a FlexPicker with a reach of 1600 mm and a mid-range payload of 6 kg. The sacrifice of a small amount of payload versus the 8 kg FlexPicker has resulted in a long reach for applications in which conveyors must be far apart or other environmental factors require long distances between pick and place movements. 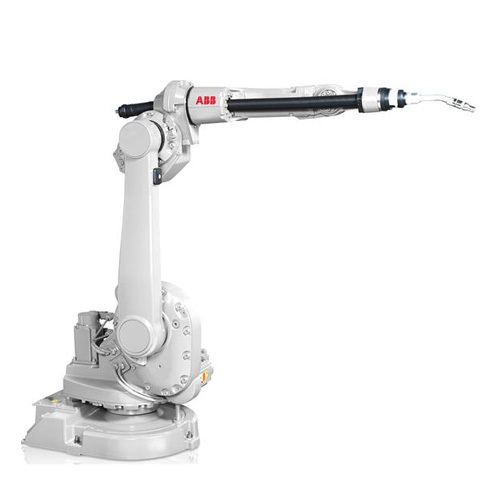 ABB’s industrial robot controllers offer superior motion control and enable quick integration of additional hardware. 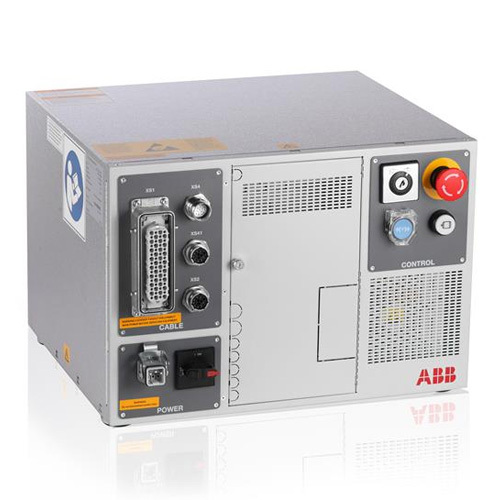 IRC5 is ABB’s fifth generation robot controller. Its motion control technology, featuring TrueMove & QuickMove, is key to the robot’s performance in terms of accuracy, speed, cycle-time, programmability and synchronization with external devices. Other features include FlexPendant with touch screen and joystick programming, flexible RAPID language, and powerful communication capabilities. RobotWare is at the heart of the system and features a number of optional plug-ins designed to increase functionality for robot users. For example multitasking, transfer of information from file to robot, communications with external systems or advanced motion tasks..
SafeMove marks a major step in removing the bonds placed on industrial robots and makes possible human - robot collaboration. Developed and tested to comply with international safety standards, SafeMove is an electronics and software based solution that ensures safe and predictable robot motion. 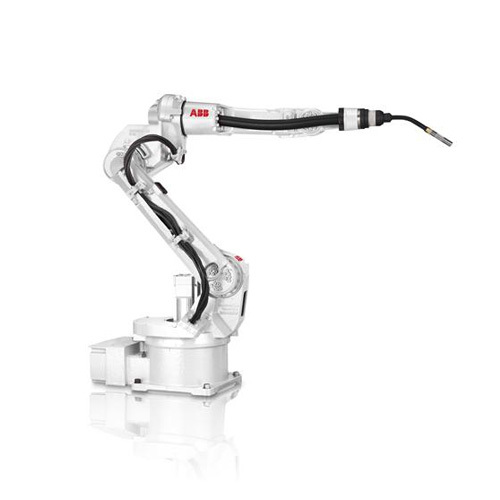 ABB's fifth generation robot controller. Its motion control technology, TrueMove and QuickMove, is key to the robot’s performance in terms of accuracy, speed, cycle-time, programmability and synchronization with external devices. Watch the FANTA Can Challenge movie below to see this superior motion control in action. The IRC5C offers the capabilities of the powerful IRC5 controller in a compact format. It delivers space saving benefits and easy commissioning through one phase power input. It comes equipped with external connectors for all signals and a built in expandable 16 in, 16 out I/O system. 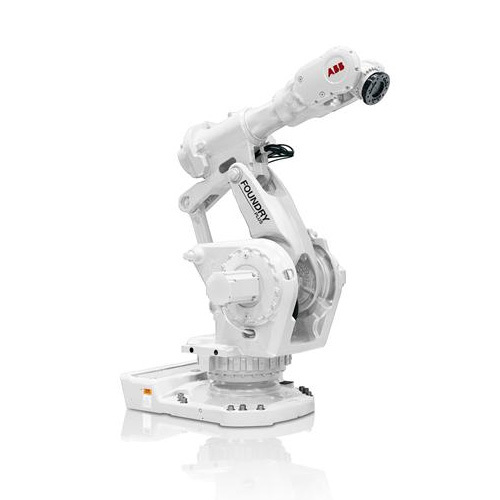 Quality painting made easy IRC5P is the newest generation paint robot control system from ABB. With its own FlexPaint Pendant it is specifically designed for the paintshop. The new paint robot control system significantly reduces the time for installation and commissioning. IRC5P provides faster set up and configuration of IPS, RobotWare Paint, RobView and PLC mapping. The system automatically adapts to the process configuration in the installation. 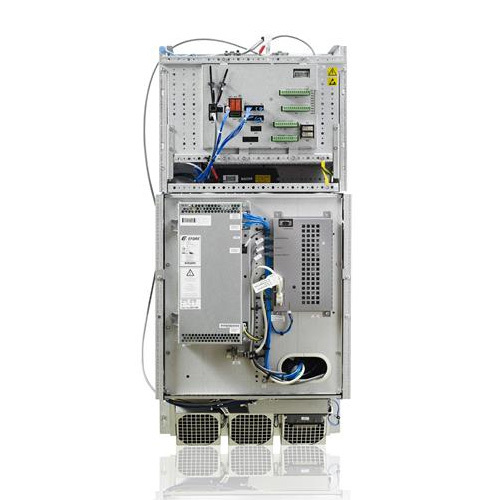 Available without a cabinet, the Panel Mounted Controller, or PMC, can be integrated into any enclosure for customization or for special environmental requirements. It is comprised of two modules, one for the drive modules and one for the computer.